Serneke has today signed an agreement with the Municipality of Falkenberg to build a new knowledge and culture center. The project is the Municipality of Falkenberg’s largest investment to date, with the order value amounting to about SEK 195 million. “The new knowledge and culture center will be an iconic building of great importance to many people in Falkenberg and it is an honor for us to construct it. We are very happy that the Municipality of Falkenberg has entrusted us with this and look forward to a successful partnership,” says Karl Wetterlund, Construction Manager at Serneke Construction. The new knowledge and culture center will house a new library and a new upper-secondary school, which will also include a school of culture. The building will have a total area of ​​approximately 7,400 square meters (BTA) over four floors and a basement. Considerable emphasis is being placed on renewable energy and most of the roof will be equipped with solar cells. The building is to be certified in accordance with the requirements of the Sweden Green Building Council, Environmental Building with Silver level verification. The design was developed by means of an architectural contest in which the “Outsight – Insight” contribution from Fojab Arkitekter in Malmö presented the winning proposal. 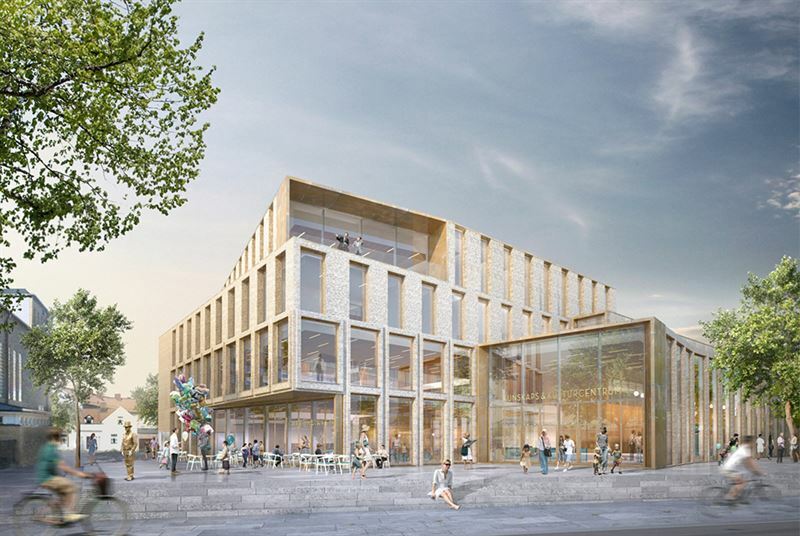 “The knowledge and culture center will be an important building in Falkenberg and a boost to how the center is perceived. We are very pleased to have signed an agreement with Serneke, enabling us to maintain our schedule, with construction expected to commence during the spring,” says Irene Wigroth, Head of the Construction and Project Unit at the Municipality of Falkenberg. The project is a turnkey contract with the start of construction estimated to take place in the spring of 2018. The project will be completed at the end of 2019/beginning of 2020. The order value of approximately SEK 195 million is included in order bookings for the fourth quarter of 2017. This information is such that Serneke is required to disclose under the EU Market Abuse Regulation. The information was submitted under the auspices of the contact person stated above, for publication on December 21, 2017, 9:30 A.M. CET. Serneke is a rapidly growing corporate group active in construction, civil engineering, project development and property management. The Group was founded in 2002 and today has income of nearly SEK 5 billion and nearly 1,000 employees. Through novel thinking, the Company drives development and creates more effective and more innovative solutions for responsible construction. The Company builds and develops housing, commercial buildings, industrial facilities, public buildings, roads and civil engineering projects, and other infrastructure. The Company’s customers are public and commercial clients, and operations are focused on the three metropolitan regions in Sweden, Gothenburg (Region West), Stockholm (Region East) and Malmö (Region South). Serneke’s headquarters are located in Gothenburg and the Company also has offices in Stockholm, Malmö, Helsingborg, Borås, Halmstad, Strömstad, Trollhättan, Varberg and Alingsås. The Company’s Series B shares (SRNKE) have been listed on the Nasdaq Stockholm exchange since November 2016.